We were to bring two 5 page papers with us to our first Confluence of Cultures class. One was to be over cultural background and the other over religious background. We sat in a circle in our classroom in the basement of the campus library, and as I ended up next to the professor, I had to share first. Now, I'm not a very outgoing person generally. I'm not awkwardly or painfully shy or anything, but I'm not the person to just open up. So what I shared was fairly limited. I didn't want to share any details at all with this small group of strangers. Little did I know, the sharing we did that first day would only be the tip of the iceberg. This class definitely pulled me out of my shell. Words cannot describe the experience Confluence of Cultures offered me. I wish I could write every detail about it, but I'm pretty sure you don't want to read the quantity of a book in one post. But in short, it became far more than just a class. Granted, it was still very class-like in some ways. We had several books to read and papers to write during the semester. However, Mike, our professor, also brought in a personal element with several guest speakers and group discussions. Confluence of Cultures was a class to learn about Islam, Arabic countries, "the Middle East," culture, religion, etc. I truly cannot say what all I learned from this class. To sum it all up, this class seemed to me to be about personal discovery and reflection. This personal discovery and reflection for me was partly about religion, partly about nationality, but deeply about humanity, myself, and what social categories and their implication meant to me. In addition to our in class meetings with the 10 of us and Mike, we had weekly Soliya meetings. 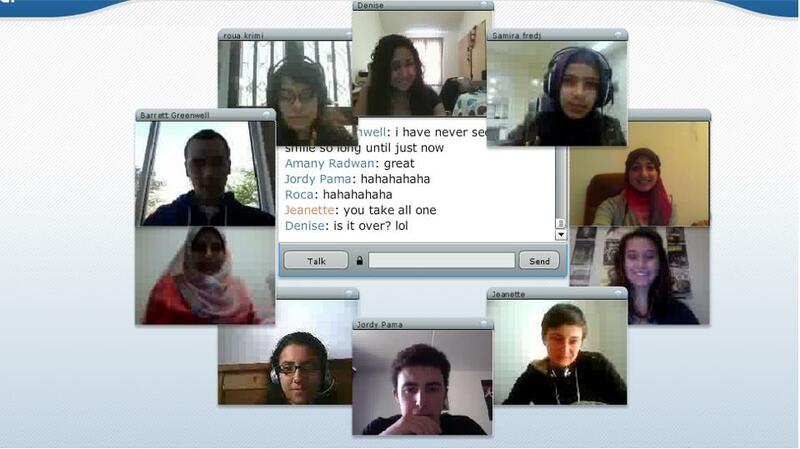 Soliya is a web platform that connects students in the "Western world" with students in the "predominantly Muslim world" through video conferencing (think conference call crossed with Skype... or just look at the photo below lol). The first week of Soliya meetings, I had a Thursday meeting at 4:30 am. I basically rolled out of bed and turned my computer on. I have to say, I was very nervous. I was expecting arguments and awkward silences. Let me tell you, that was not the case at all. I had an amazing Soliya group from the very start! With 8 students and 2 facilitators from the United States, the Netherlands, Germany, Tunisia, and Egypt who were Christian (of various types), Muslim, and Atheist, we had quite the mix. I know no other words to describe this experience but beautiful and insightful. Over the several more weeks my Soliya group met, we discussed everything from politics to religion to personal stories and everything in between. The two hours flew by every time we met, and from the moment the sessions ended, I began looking forward to the next. I will discuss the thoughts this experience provoked and the changes it inspired much more in depth in my next post or two, but all in all, I have to say, my Confluence of Cultures class with its readings, discussions, guest speakers, videos, reflections, and Soliya component absolutely changed my life. I cannot say how thankful I am for this incredible experience. I never thought a college class could be so life altering, but this one, through the people I interacted with, was just that. and Jeanette, Ruaa, Amany, Barrett, Jenna, Jordy, Lili, Roca, and Samira (my Soliya group).